I have enjoyed the trees and scenery of Kentucky exceedingly. Skip and I have long been outdoor enthusiasts, and as our regular readers know, the Red River Gorge is a place that has beckoned to us throughout the years. Escaping into the cool, deep green forests has always been a necessity and a balancing force in our lives. Exploring cliff line, climbing to ridge tops, and wading in creeks and streams is physically therapeutic and spiritually renewing. This is a common theme we find with couples who tour our wedding venue. We all belong to a tribe that feels an unnameable connection with the Red River Gorge. We feel more at home and alive among the rugged cliffs and verdant old mountains. It’s an innate longing for a place; an unbreakable bond that deepens with time. There’s adventure to be had satisfying our primal hunger for adrenaline. There’s quiet, reflective repose to stare off in the distance atop a high ridge and recharge both body and mind. There’s places for celebration for milestones accomplished, and places for intimate and serene moments that begin new journeys in life. 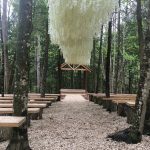 When it came time to search for our perfect place to say “I do” in our forest wedding, we knew immediately nothing else would do, than to celebrate in nature’s own perfect temple. We considered several different locations on the property, but late one evening while strolling hand-in-hand, we happened upon an area of the woods that was so beautiful and perfectly situated with stately Hemlocks naturally distilling the sunlight; casting an ethereal glow over us as we marveled at the near perfect symmetry of the natural aisle, the gently sloped grade of the ground, and the big leaf magnolias creating a protective canopy overhead. This was it. The place spoke to us and we were compelled to listen. We added a gazebo between two perfectly positioned magnolias, and antique doors lead you into the natural cathedral. Simple benches were tucked between trees for seating, and gravel was laid to brighten the space a bit and for function. Only one portion of a tree was cut to allow for the aisle, and everything else was left as we found it. 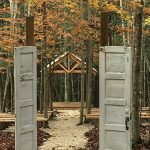 We wanted to honor the organic feel of the space while at the same time, creating a place for couples drawn to the Red River Gorge, to begin their journey together in marriage. We are humbled at the number of people who appreciate, and feel a connection with the space we were honored to be stewards of, and we are excited to celebrate together with those of our tribe who are healed and strengthened by time spent in nature. For those in need of a space to play in, pray in, celebrate in, or begin a new journey in, we would love to welcome you to our place. Come tour our wedding venue, and experience the serenity for yourself.